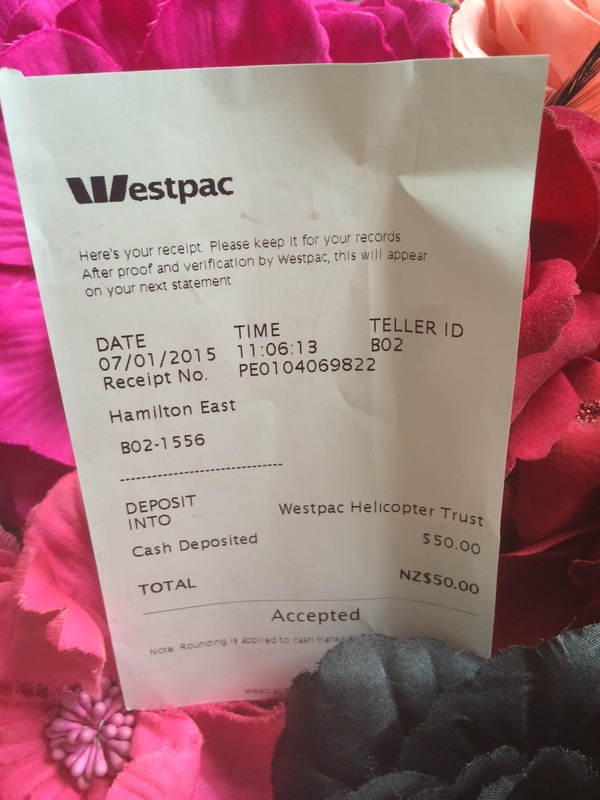 Here’s the receipt for the donation I made to the Westpac Helicopter Trust (Waikato) today. This was the charity that was randomly drawn out of a hat … it was nominated by Miss Chevious Cinders. If you read my Pinup December summary here, you’ll know that I decided, in the end, to make a donation to both the SPCA as the most frequently chosen charity by Pinup December ladies, and to the Westpac Helicopter Trust as well. Thank you to all the lovely Pinup December ladies who took part … later this week I’ll put up the SPCA receipt! Posted on January 7, 2015 October 5, 2018 by MumptyStylePosted in Burlesque/PinupTagged charity, donation, Miss Chevious Cinders, Pinup December, Pinup December donation, Westpac Helicopter Trust (Waikato).